As I only bring up the number 22 since it belongs to one of my past favourite IndyCar Drivers named "Sumone." Perhaps Y'all have heard of this 2016 IndyCar Series Champion Simon Pagenaud, Eh? Although I wasn't impressed with Pagenaud's "Drifting" tactics upon the High banks for which John Hindhaugh noted was a Bit Naughty! Whilst Juan Pablo Montoya's reputation for knocking fellow competitors about finally caught up with him when the Columbian was issued a Drive-thru penalty towards the end of the race for Nerfing a "Slower" GT Daytona car, the #29 perhaps? Yet what better way to start the day off then by listening to the Speed Freaks interview with the Pole Winner Renger van der Zande, when Ah-waitin' the Pre-race blather to begin upon FOX, where I caught the first three hours of coverage, before switching over to Zed Internetz' for the duration. As I especially enjoyed the portion of "Ringer" asking Statmann' what's this Chrome Horn? Witch we all know 'Ol PT, nee Paul Tracy immortalized during his racing career; Hya! The most Bizzaro occurrence of the race for Mwah was the unheard of penalty issued to the then GTD (Daytona) Class leading No. 29 Montaplast by Land-Motorsport's Audi R8 LMS GT3 being slapped with an unprecedented 5min Stop 'N Hold penalty for refueling too quickly! As the Montaplast team was deemed to have been accomplishing their Pit stops too fast, as IMSA's BoP (Balance of Performance) rules also encompasses teams refueling rigs fitted with flow restrictors, a la engine induction air restrictors. IMSA rules are reportedly Intended to ensure equal flow rates between all competitors, since the various chassis have varying fuel tank capacity, and drink Thar Petrol at different rates, hoping to keep the competitors bunched-up on thou racing tarmac. At 10.5hr completed, only Top-4 DPi's were on lead lap with the 2 Team Penske Acura's leading the 2 Action Express Racing (AXR) Cadillac's: Nos. 7-6 ahead of the 5-31 respectively. And this Fred Chap, the media darling, nee Fernando Alonso had a long brake pedal. Seeing the Spaniard fly straight thru Turn-1 without stopping! As the United Autosports Ligier's long brake pedal required a master brake cylinder replacement, ultimately taking 40mins to repair. Meanwhile, the action was Hotting Up between the leaders, as JB' (João Barbosa) passes 2nd place Pagenaud, Felipe Nasr in the Seester' AXR Cadillac passed both to go from P4 to second, as the Acura's & Caddys' were going Hammer 'N Tongs. With 13hrs remaining and Driver swaps occurring, Graham Rahal in Team Penske's #7 drops from P1 to 3rd with both AXR cars passing him. At 10:42PM Saturday - Pacific, (when I tried typing this) I thought I heard the following leader board for the three classes. (Prototypes) #5-31-7-6. (GTLM) #66-67-3-4, and (GTD) #33-48-86-64.
and Don't wanna say it was a Dull race but, the various IMSA (RS2) Radio Pundits just prattled on 'N on about Lap No. 776's breaking the mileage record held since 1982 by the JLP Racing Porsche 935 that some Chap named Zachery Brown owns. As both the previous distance and laps completed records fell due to the race's abnormally low amount of caution flags, with only a total of four Full course cautions being thrown. This enabled the speedy Prototypes, specifically the winning No. 5 Mustang Sally'; Err Sampling Cadd-Oh-lacc' to complete a staggering 808-laps, shattering the previous record of 762 set in 1992! Being the first time ever to eclipse 800-laps. As Filipe Albuquerque gained a measure of redemption when taking the chequered flag ahead of the team's #31 after having lost the race with six minutes remaining last year! Whilst João Barbosa and Christian Fittipaldi each claimed their third Rolex watches. This new lap record also saw a new distance record of 2,876.85 miles being completed in 24hrs, also shattering the previous record's 2,760.960 miles set in '82 by the aforementioned Porsche 935 JLP3 driven by "the Paul's," the father-son John Paul duo along with Rolf Stommelen. Yet when tuning back in with some four and a half plus hours remaining, I was disappointed that the typically Crack radio Le Mans crew, Der Heindenmeier's company which also does the IMSA Radio broadcasts, never explained what happened during the night-early morning hours which ultimately saw the #5 leading the race by 3-laps over its Seester' #31. Whilst the new to the B-I-G BOYZ' Prototypes class Cor Autosport #54 gave valiant chase to unwind itself from six laps down to finish a minute and a-half behind the two Action Express Racing (AXR) Cadillac's on the same lap, third overall. Hurrah! Was rootin' primarily for Ryan Briscoe to be victorious in the GT Le Mans class, as I'll forever recall him being the consummate Gentleman to Mwah at Mother Speedway, when he turned round, jumped down and casually chatted me up for nearly 10mins at Mother Speedway during the Pit-stop contest. While the Chip Ganassi Ford GT's indeed finished 1-2, with the No. 67 leading the No. 66, another bit of history was made, as it was Cheeps' 200th Overall victory, along with him being present as the race's Grand Marshall. Continuing the history theme, as I kept my fingers crossed during the last 34mins for the #11 to win. As the #33 Riley Merc' AMG GT3 saw Jeroen Bleekemolen hunting mercilessly for a way past the GRT Grasser Racing's Mirko Bortolotti, literally atop the Lamborghini Huracan GT3's gearbox! While Bortolotti led by one scant solitary second of the race's waning laps! Jeroen was finally called in for the Splash 'N Go he needed to finish the race. 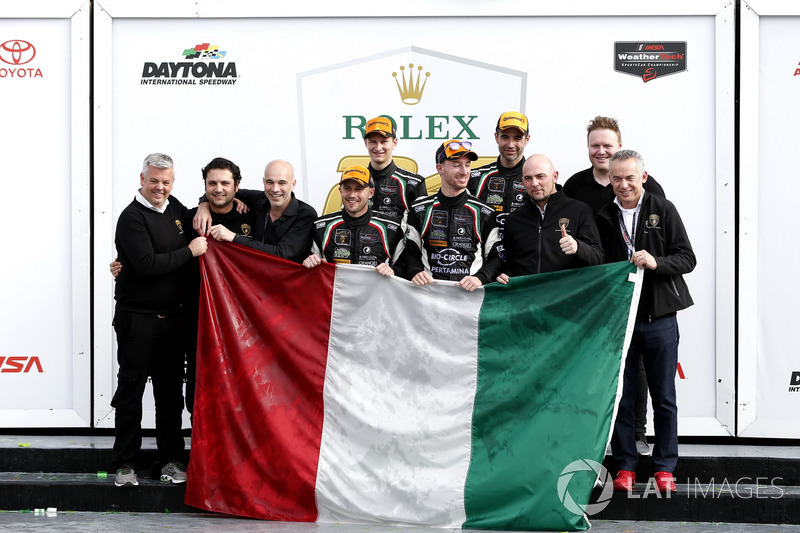 Thus Italy's Bortolotti & Co. gave Lamborghini its first ever 24hr victory ever worldwide! Originally I was torn between the #11 and the chasing Michael Shank #86 Acura NSX GT3 for GTD class honours, since the Shank car featured A.J. Allmendinger and Thy Leggy Juan', nee Katherine Legge. A.J. Allmendinger on Kroger, Shank & Who's That? Yet I decided I wanted the No. 11 instead, especially since it featured the totally forgotten Monsieur Perera, who I've mentioned briefly flirted with an IndyCar career a decade ago. As I'm guessing it's Frank Perera's career highlight? With the victory being even sweeter since the car had been sent to the rear of the grid for a rules violation during Qualie'.